When the Almighty Spirit first created the Earth, He made the land completely flat. Looking down at His creation, He was satisfied with His work, except for the fact that there were no mountains. So He loaded up an enormous sack with innumerable rocks and boulders, and sped down to distribute them across the surface of the Earth. As the Almighty Spirit was approaching the planet, His enemy, the Evil One, accompanied by three cohorts – famine, pestilence and hardship – appeared behind Him, and slashed open the bag full of mountains. The colossal rocks and boulders tumbled down to Earth, and landed one on top of the other on a narrow strip of land between the Black and Caspian Seas, the Caucasus. No better impression of the physical environment of the Caucasus Mountains can be depicted than from this traditional Caucasian folktale. Bordering Iran to the North, the Caucasus ranks among the most grandiose and hostile landscapes in the world. Here lies a single narrow ridge of mountains stretching 400 miles east to west and containing twelve peaks higher than the tallest in the Alps, along with numerous glaciers and tumbling gorges that rival those of the Himalayas. The mountains are climaxed by Mt. Elbruz, towering to 18,493 feet above sea level. Here, in Greek legend, the god Zeus chained Prometheus for eternity as punishment for delivering fire to man. For centuries, the Caucasus provided refuge for nomadic peoples who were forced to go there after being driven out of more hospitable areas. Approximately 350 different tribes resided in the Caucasus, speaking over 150 distinct languages. Along with the Moslem Lesghis, Chechen, and Talish, there were clans of Mountain Jews, Christian Armenians, Buddhist Kalmucks, Norsemen and even a group of Württemburg Germans. These mountain peoples were known both for their spirited sense of independence and their longevity, with many tribal elders apparently living decades past one hundred years. One clan, the Circassians, were noted for the great beauty of their women, who were sometimes either stolen or traded, breeding their olive complexions, striking eyes and distinguished countenances into the ruling families of Turkey. The existence of the Caucasian tribespeoples depended entirely on their ability to cultivate a simple innovativeness of lifestyle, along with a deep understanding of the natural forces which governed them. They learned to find strength and inspiration in the harsh, yet majestic mountain surroundings. By living a life of almost continuous physical activity, they learned to tap into the instinctive nature hidden within to guide them. 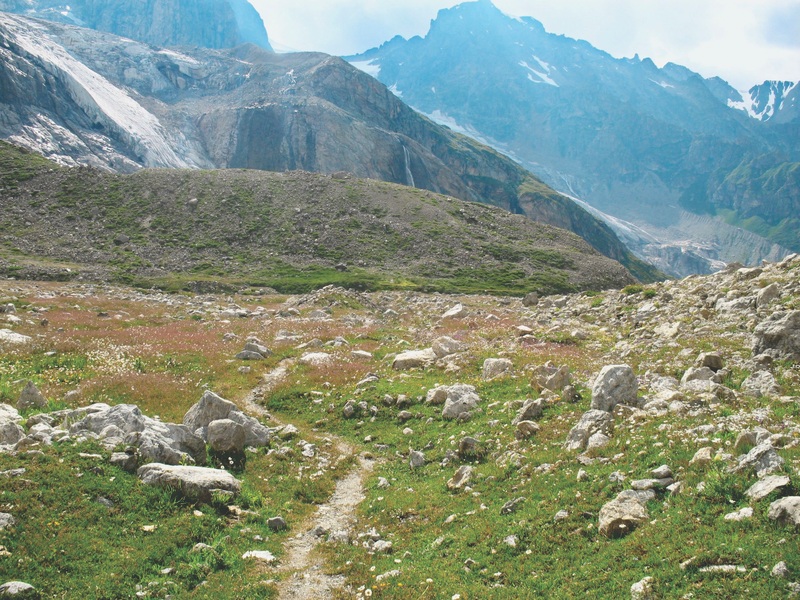 The Caucasian nomads often knew only two environments during their entire lifetimes: the high mountain meadow to which they brought their sheep to graze during the summer, and the deep valley below in which they waited out the winter. He lived in either a small tent blackened with smoke or a “kosh,” a dimly lit sod hut literally dug out of a hillside. The nomads learned to have gratitude for anything that provided comfort or beauty, and gratitude that he had life itself. Perhaps as an expression of the deep joy of a people living and working close to the earth, the tribespeople wove rugs. 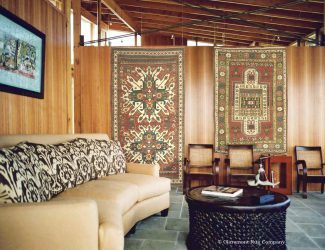 As a whole, antique Caucasian carpets possess an individuality, a boldness and deep sense of unity which is unsurpassed in the world of antique Oriental rugs. 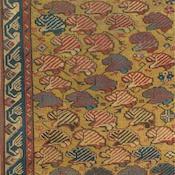 What is most striking about the antique Caucasian carpet is its daring use of color. Balance of color is achieved here not by shading, but rather through contrast. The predominant reds, blues, greens and yellows would seem clashing to the mind, yet in actuality, the unerring confidence of the Caucasian craftsmen created color combinations so harmonious that they have been marveled at and studied by Western artists for centuries. 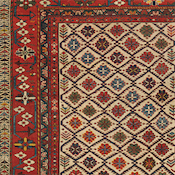 The Caucasus lies at the very heart of the rug-weaving world. 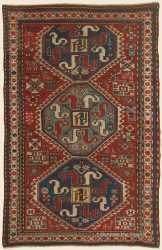 Because of its proximity to the silk route, its rug makers were affected by the influence of every rug-making tradition from Egypt to China. 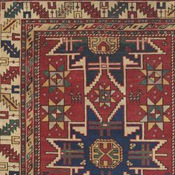 The Caucasian tribespeoples, working small, portable looms, have taken the form of more sophisticated antique tribal rug weaving cultures. By transforming these designs into simple geometrical proportions, they have brought to them a new freshness and spontaneity. 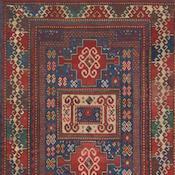 The entire evolution of tribal rug weaving can be seen in Caucasian antique carpets. The dragon motif, boteh, flowerhead, arabesque, palmette, birds, animals, cloudband and crab designs are all present. Sometimes many of these are found in a single antique rug! In the midst of powerful geometrical diamonds there may be a tiny horse, dog or gazelle. Determination and intensity side-by-side with good humor and lightness demonstrate the dexterity of the Caucasian weavers. Because of the physical lack of accessibility of the Caucasus to the outside world and the spiritedness of its peoples, natural dyestuffs were still used almost exclusively through 1920. This is over fifty years after the introduction of much easier-to-work-with, but infinitely less brilliant analine dyes. 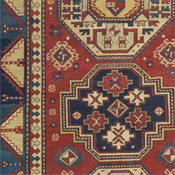 Similarly, it was not until the early 20th century that Caucasian rugs were woven for export. The many fine examples from the late nineteenth and early twentieth centuries are clearly original, authentic tribal works of art in every regard. 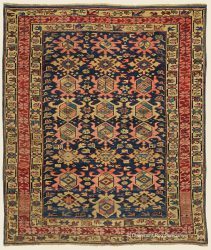 The Caucasian nomads wove antique carpets for their own daily use, to satisfy their singular sense of creativity and harmony. Accordingly, they put a level of care into their work which seems virtually incomprehensible to us today. The wool they used provided a superior level of resilience and luster because it was shorn from the sheep which they himself had grazed in high mountain pastures. It was then cleaned and washed repeatedly so that it could thoroughly absorb the vibrant vegetable dyes. 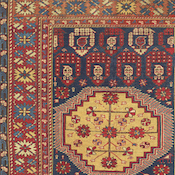 The Caucasian weavers believed that only after the material of their craft was brought to its ultimate state could they be inspired to create a rug of ultimate balance and harmony. For they did not merely see their finished product as the work of art. Instead, the art lay in performing each step of the process to completion. 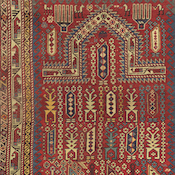 It is of little wonder that the weavings of the numerous Caucasian tribal groups enjoy a universal popularity among collectors of antique Oriental rugs today. 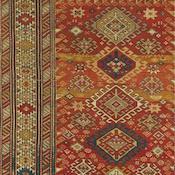 Both the thick-piled carpets from the most mountainous regions of Kazak, Karabagh and Gendje, and the thinner, more closely shorn Kubas, Shirvans, and Daghestans, from the lower slopes descending toward the Caspian Sea, are equally enchanting. These are the last remnants of an ancient weaving tradition which has now all but vanished. They are living examples which speak to us of both the gaiety and deep understanding of life possessed by their creators, the mountain weavers of the Caucasus.